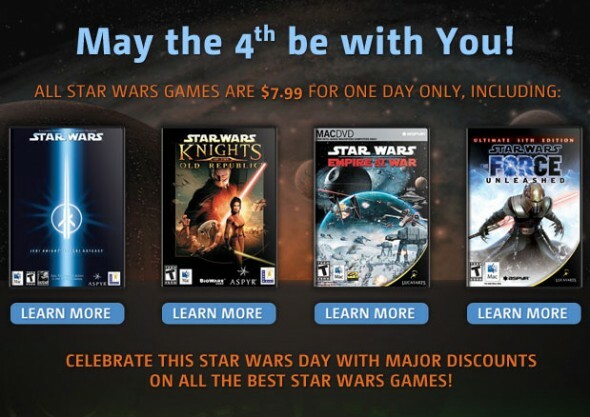 Aspyr is running a huge sale on Star Wars games for Mac tomorrow, May 4, 2012, in celebration of Star Wars Day (Through Sunday!). This includes boxed games – see Russ Looney’s comments at the bottom of the page! The Mac App Store is also running a $7.99 sale on select Mac Star Wars games. See the GameAgent site for the Star Wars sale! The selection covers a mix of first-person action/shooter types, Real-Time Strategy, and RPG. Below are a few highlights. Note: Most of these do not support Intel integrated video chipsets – check the purchase links for full details. This is the famous Knights of the Old Republic Roleplaying game (RPG) from BioWare, ported by Aspyr. One of the best RPGs out there, sci-fi or otherwise. Requirements (Minimum – See the purchase links for full details): Mac OS X 10.6.8 or later, Intel 1.8 GHz CPU or faster, 512 MB RAM/Memory, 128MB Video Memory, 5GB Hard Drive Space, ATI X1600 / NVIDIA GeForce 7300 or better. Star Wars: Empire at War is a unique game in the Star Wars universe – it’s a Real-Time Strategy (RTS) game. One problem for many of us – it’s not supported under Mac OS X 10.7 Lion. Like Empire at War, this action/adventure/first-persond game does not support Mac OS X 10.7. Like it’s predecessor Jedi Knight, it does revolve around Kyle Katarn. It features multi-player game-play across several well-known Star Wars locations. Requirements (Minimum – See the purchase links for full details): Mac OS X 10.5 or 10.6 (10.7 not supported), Intel 1.8 GHz CPU or faster, ATI X1600 or NVIDIA GeForce 7300 or better video. Includes: All original missions in Star Wars: The Force Unleashed plus three new levels, and additional new costumes and character models. Requirements: Mac OS X 10.5.8, 2.4 GHz or faster Intel Core 2 Duo. Note: The sales are NOT limited to what’s listed above – confirm the sale price before you check out! And don’t forget – tomorrow is the Quake 4 Deathmatch with the Aspyr Dev Team. The sale also applies to the boxed versions that are available at the online store GameAgent.com, FYI, though buyers will also have to pay extra for shipping. That being said, savvy shoppers can score a great two-in-one deal with the Star Wars Mac Pack box, which features both Knights of the Old Republic and Empire at War for the $7.99 sale price.